With the public paying close attention to the national debate over gun control, Barack Obama’s gun proposals receive a mixed rating from the public. 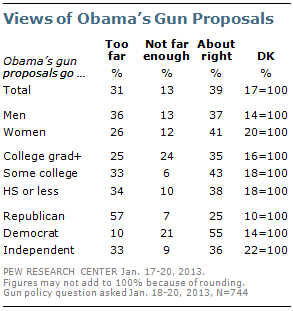 A 39% plurality say Obama’s proposals are about right while another 13% say they do not go far enough. About three-in-ten (31%) say the president’s proposals go too far; 17% do not offer an opinion. The latest national survey by the Pew Research Center for the People & the Press, conducted Jan. 17-20 among 1,006 adults, finds that the public is closely tracking the gun debate: 43% followed news about Obama’s proposals very closely and an additional 29% followed the news fairly closely. There are wide partisan divides in views of Obama’s proposals. A 57% majority of Republicans say the proposals go too far, just 7% say not far enough and 25% say they are about right. By contrast, a majority of Democrats (55%) say the proposals on guns are about right, 21% say they do not go far enough and 10% say they go too far. Independents are divided: 36% say Obama’s gun proposals are about right, while about as many (33%) say they go too far; few independents say the proposals do not go far enough (9%). Men are somewhat more likely than women to say Obama’s proposals go too far in addressing the nation’s gun laws (36% vs. 26%). As many college graduates say the proposals go too far (25%) as not far enough (24%). By contrast, among those without a college degree, more say the proposals go too far than not far enough. Slim pluralities of all education groups say the proposals are about right. The balance of opinion on Obama’s gun proposals is similar among those who are following the debate very closely and those who are following less closely. About four-in-ten (43%) say they very closely followed news about President Obama announcing proposals for strengthening gun laws; another 29% followed this story fairly closely. Interest in the gun proposals outpaced interest in all other news stories last week, including economic news (36% very closely). Interest in the gun control proposals was about as high among Republicans (44% very closely) as Democrats (47% very closely). 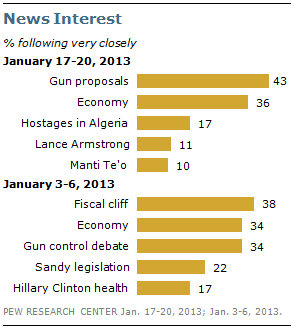 The public paid less attention to the hostage situation in Algeria (17% very closely). And two sports-related controversies, Lance Armstrong admitting he used performance-enhancing drugs and an alleged hoax involving Notre Dame football player Manti Te’o and false claims about his deceased girlfriend, garnered little public attention: just 11% followed Armstrong news very closely and 10% followed news about Manti Te’o very closely. In the first week of January, the resolution to the fiscal cliff topped the public’s news agenda with 38% saying they followed that story very closely. Economic news (34% very closely) and the debate over gun control (34% very closely) also received significant public attention in the Jan. 3-6 survey.